Being quality-centric company, we provide a supreme quality range of Bed Covers which are fabricated according to the modern fashion trends. Our bed covers are skillfully created by our proficient designers who possess rich domain expertise. The provided bed covers are offered in a different colors, designs and prints. This range includes Designer Bed Covers. We provide our product range at most affordable prices. 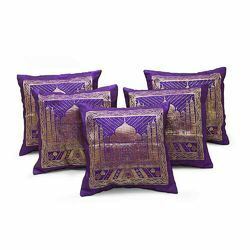 This cushion cover is in Purple color made from shiny Polyester fabric. It is graced with brocade work exclusive Tajmahal design in the center. These come in 12x12 inches size with excellent pattern in traditional Sanganeri style to make it look elegant. These traditional and ethnic creations are one of the specialties of Rajasthan. This cushion cover is in White color made from shiny Polyester fabric. It is graced with brocade work Peacocks and Elephants design in the center. These come in 12x12 inches size with exellent pattern in traditional Sanganeri design to make it look elegant. These traditional and ethnic creations are one of the specialties of Rajasthan. This cushion cover is in Royal Blue color made from shiny Polyester fabric. It is graced with brocade work Rajasthani Chakri design in the center. These come in 12x12 inches size with exellent pattern in traditional Sanganeri style to make it look elegant. These traditional and ethnic creations are one of the specialties of Rajasthan. This is a 5 piece cushion covers set in Brown color made from shiny Polyester fabric. It is graced with brocade work Peacock design in the center. These come in 12x12 inches size with exellent pattern in traditional Sanganeri design to make it look elegant. These traditional and ethnic creations are one of the specialties of Rajasthan. Color Available in various colors. This is a fabulous quilted cushion covers from Little India ! The lovely Stripes pattern creates a sensational design for this set which makes a home in everyone's heart. This set contains foam and comes in 16x16 inches inches size. 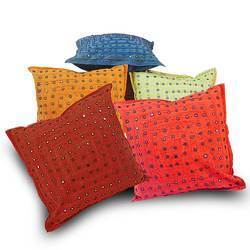 Made from cotton, this set of Five cushion covers is durable and easy to clean and maintain. Being a one stop shop for home décor and furnishing, Little India sells home products all over the world with perfection. This is an assorted cushion cover in multicolor. These are graced with five different color broad velvet stripe in the center along with square brocade designs at the border. All cushion covers in the set come in 16x16 inches inches size with exellent designer patterns in traditional style to make them look elegant. 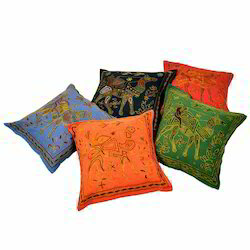 These traditional and ethnic cushion cover creations are one of the specialties of Rajasthan. This cushion cover is graced with hand embroidered mirror work, adorned with exquisite laces. Aesthetically designed cushion cover will match the ambience of your house. Each cover is adorned with matching laces to make it worth buying. The cute little mirrors with matching threads transforms the cushion cover into masterpiece of beauty. The cushion covers are finished with broad cotton matching piping. 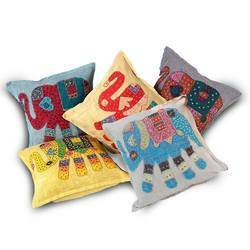 These handmade fluffy cotton cushion covers show case the craftsmanship of Rajasthan. This cushion cover is graced with hand embroidery and mirror work. Aesthetically designed cushion cover will match the ambience of your house. Each cover is adorned with matching work to make it worth buying. The beautiful little mirrors with matching threads transform the cushion cover into masterpiece. The cushion covers are finished with broad cotton matching piping. These handmade cushion covers showcase the craftsmanship of Rajasthan. 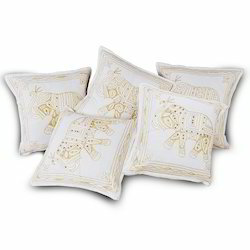 This cushion covers is graced with camel shape embroidery work in the center. 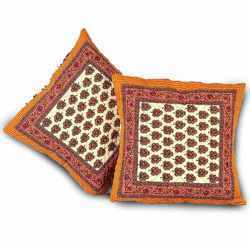 These cushion covers come in 16x16 inches inches size with exellent pattern in traditional Sanganeri style to make it look elegant. These traditional and ethnic creations are one of the specialties of Rajasthan. This cushion cover is graced with hand stitched patch work, adorned with exquisite hand embroidery. Each cover is enhanced with designer elephant patch work stitched with strong thread. The elephant patch is decorated with colourful thread embroidery by hard working women of Rajasthan. The covers are finished with broad cotton piping for graceful appearance. These good looking cushion covers are specialty of Jaipur. This cushion cover is graced with hand embroidery and adorned with exquisite designs. 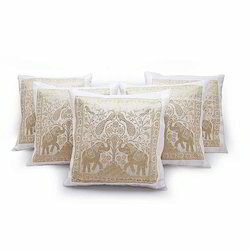 This elephant pattern made with zari embroidery on the Cream base. Each cover is finished with broad cotton piping makes it ultimate masterpiece. The product presents a good example of traditional craftsmanship of Rajasthan. 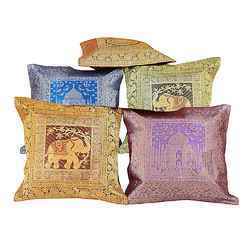 These good looking cushion covers are specialty of Jaipur. 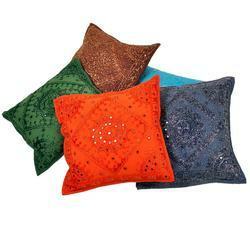 This is an assorted cushion cover in multicolor. These are graced with brocade elephant design in the middle of colorful velvet patches around. The borders possess various brocade design too. 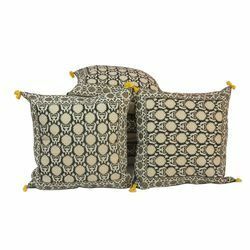 All cushion covers in the set come in 16x16 inches inches size with exellent designer patterns in traditional style to make them look elegant. 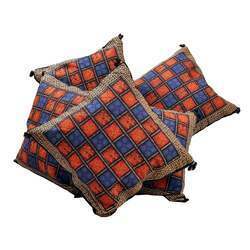 These traditional and ethnic cushion cover creations are one of the specialties of Rajasthan. This is an assorted cushion cover in multicolor. These are graced with dual designer brocade stripes in between, with vibrant multicolor combinations. All cushion covers in the set come in 16x16 inches inches size with exellent designer patterns in traditional style to make them look elegant. 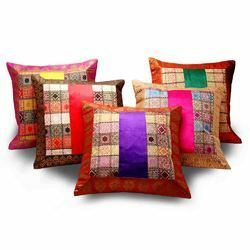 These traditional and ethnic cushion cover creations are one of the specialties of Rajasthan. 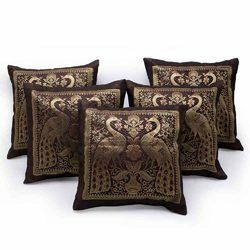 This black-golden 2 piece cushion cover set is made from Brocade This cushion cover is in Orange color made from shiny Polydupion Silk. It is graced with brocade work Peacock and Elephant designs in the center. These cushion covers come in 43x43 cms size with exellent round shape pattern of traditional Rajasthani look to make it elegant. These traditional and ethnic creations are one of the specialities of Rajasthani artwork. Decorate & brighten up your dining space with this fabulous traditional table runner from the house of Little India. This exquisite Golden silk table runner with brocade work will compliment your dining table settings by adding a different shade of color, texture and a touch of elegance. 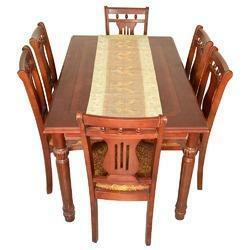 Also it will bring a sense of tradition to your table-scape. It will win many compliments from the onlookers by reimagining the familiar dining space in whole new ways. It is perfect to create a sophisticated, vibrant place setting. 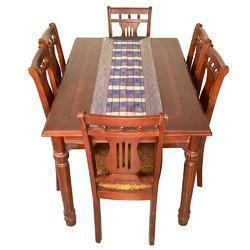 Decorate & brighten up your dining space with this fabulous traditional table runner from the house of Little India. This exquisite Black silk table runner with brocade work will compliment your dining table settings by adding a different shade of color, texture and a touch of elegance. Also it will bring a sense of tradition to your table-scape. It will win many compliments from the onlookers by reimagining the familiar dining space in whole new ways. It is perfect to create a sophisticated, vibrant place setting. 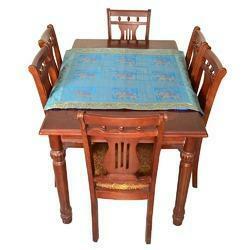 Decorate & brighten up your dining space with this fabulous traditional table runner from the house of Little India. This exquisite White silk table runner with brocade work will compliment your dining table settings by adding a different shade of color, texture and a touch of elegance. Also it will bring a sense of tradition to your table-scape. It will win many compliments from the onlookers by reimagining the familiar dining space in whole new ways. It is perfect to create a sophisticated, vibrant place setting. 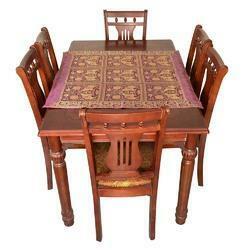 Decorate & brighten up your dining space with this fabulous traditional table runner from the house of Little India. This exquisite Royal Blue silk table runner with brocade work will compliment your dining table settings by adding a different shade of color, texture and a touch of elegance. Also it will bring a sense of tradition to your table-scape. It will win many compliments from the onlookers by reimagining the familiar dining space in whole new ways. It is perfect to create a sophisticated, vibrant place setting. 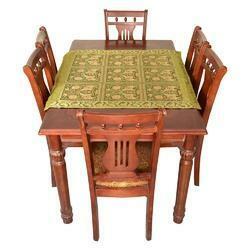 Decorate & brighten up your dining space with this fabulous traditional table runner from the house of Little India. This exquisite Maroon silk table runner with brocade work will compliment your dining table settings by adding a different shade of color, texture and a touch of elegance. Also it will bring a sense of tradition to your table-scape. It will win many compliments from the onlookers by reimagining the familiar dining space in whole new ways. It is perfect to create a sophisticated, vibrant place setting. 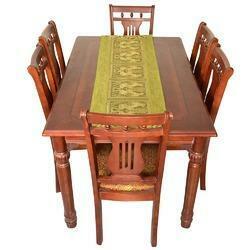 Decorate & brighten up your dining space with this fabulous traditional table runner from the house of Little India. This exquisite Blue silk table runner with brocade work will compliment your dining table settings by adding a different shade of color, texture and a touch of elegance. Also it will bring a sense of tradition to your table-scape. It will win many compliments from the onlookers by reimagining the familiar dining space in whole new ways. It is perfect to create a sophisticated, vibrant place setting. 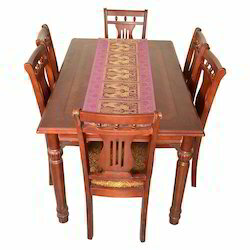 Decorate & brighten up your dining space with this fabulous traditional table runner from the house of Little India. This exquisite Red silk table runner with brocade work will compliment your dining table settings by adding a different shade of color, texture and a touch of elegance. Also it will bring a sense of tradition to your table-scape. It will win many compliments from the onlookers by reimagining the familiar dining space in whole new ways. It is perfect to create a sophisticated, vibrant place setting. 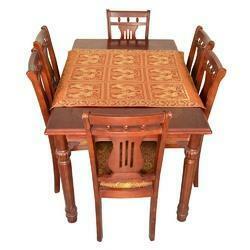 Decorate & brighten up your dining space with this fabulous traditional table runner from the house of Little India. This exquisite Brown silk table runner with brocade work will compliment your dining table settings by adding a different shade of color, texture and a touch of elegance. Also it will bring a sense of tradition to your table-scape. It will win many compliments from the onlookers by reimagining the familiar dining space in whole new ways. It is perfect to create a sophisticated, vibrant place setting. 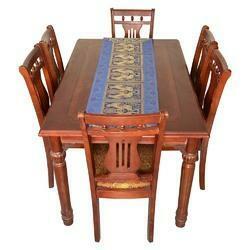 Decorate & brighten up your dining space with this fabulous traditional table runner from the house of Little India. This exquisite Green silk table runner with brocade work will compliment your dining table settings by adding a different shade of color, texture and a touch of elegance. Also it will bring a sense of tradition to your table-scape. It will win many compliments from the onlookers by reimagining the familiar dining space in whole new ways. It is perfect to create a sophisticated, vibrant place setting. Decorate & brighten up your dining space with this fabulous traditional table runner from the house of Little India. This exquisite Magenta silk table runner with brocade work will compliment your dining table settings by adding a different shade of color, texture and a touch of elegance. Also it will bring a sense of tradition to your table-scape. It will win many compliments from the onlookers by reimagining the familiar dining space in whole new ways. It is perfect to create a sophisticated, vibrant place setting. Decorate & brighten up your dining space with this fabulous traditional table runner from the house of Little India. This exquisite Green table runner with brocade work will compliment your dining table settings by adding a different shade of color, texture and a touch of elegance. Also it will bring a sense of tradition to your table-scape. It will win many compliments from the onlookers by reimagining the familiar dining space in whole new ways. It is perfect to create a sophisticated, vibrant place setting. 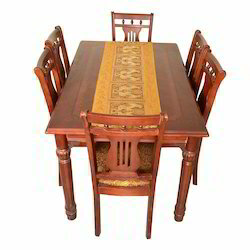 Decorate & brighten up your dining space with this fabulous traditional table runner from the house of Little India. This exquisite Purple silk table runner with brocade work will compliment your dining table settings by adding a different shade of color, texture and a touch of elegance. Also it will bring a sense of tradition to your table-scape. It will win many compliments from the onlookers by reimagining the familiar dining space in whole new ways. It is perfect to create a sophisticated, vibrant place setting. 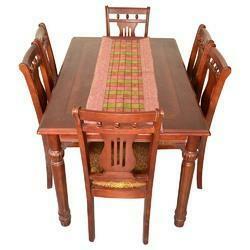 Decorate & brighten up your dining space with this fabulous traditional table runner from the house of Little India. This exquisite Orange silk table runner with brocade work will compliment your dining table settings by adding a different shade of color, texture and a touch of elegance. Also it will bring a sense of tradition to your table-scape. It will win many compliments from the onlookers by reimagining the familiar dining space in whole new ways. It is perfect to create a sophisticated, vibrant place setting. This Rajasthani cushion cover is graced with colourful Sanganeri hazy print on pure cotton fabric. Each cover is also adorned with Bagru print on its border. These Handmade fluffy cotton cushion covers are hand crafted by hard working women of Rajasthan. The Sanganeri print is world famous for its traditional designs. These good looking cushion covers are specialty of Jaipur. This Rajasthani cushion cover is graced with floral Sanganeri print on pure cotton fabric. Each cover is also adorned with intricate Bagru print on its border. These Handmade fluffy cotton cushion covers are hand crafted by hard working women of Rajasthan. The Sanganeri print is world famous for its traditional designs. These good looking cushion covers are specialty of Jaipur. 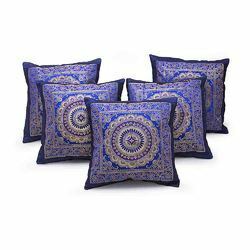 This Sanganeri cushion covers is graced with royal floral print on pure cotton fabric. Each cover is also adorned with Bagru print and Orange booti pattern on its border. These handmade fluffy cotton cushion covers are hand crafted by cottage industrial women of Rajasthan. The Sanganeri print is world famous for its traditional designs. This kind of special floral and booti print on cushion covers is one of the specialties of Jaipur. This cushion cover is made from Brocade silk cloth. It is also decorated with assorted brocade laces on each cover adding shimmer to it. The golden Zari work makes it look royal. These traditional and ethnic creations are the specialty of Rajasthan. 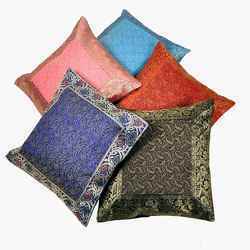 This multicolour cushion cover is made from Brocade silk cloth. It is also decorated with assorted brocade laces on each cover adding shimmer to it. The golden Zari work makes it look royal. These traditional and ethnic creations are the specialty of Rajasthan. 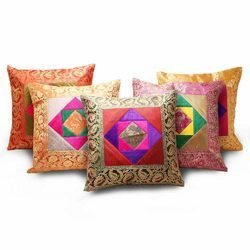 This multicolour cushion cover is graced with hand embroidered brocade work and adorned with exquisite designs. It is decorated with assorted designs on each cover adding shimmer to it. 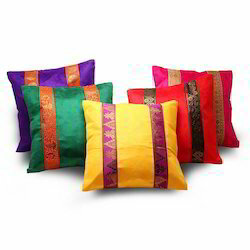 Each cushion cover is beautified with colourful silk threads work is making it royal. The silver and golden zari work is displaying the traditional craftsmenship of Rajasthan. These good looking cushion covers are specialty of Jaipur.